Stage 1 of the Tour de France gets underway later. It is a pretty flat 212km stage, heading out from Porto Vecchio and rolling along the coast up to Bastia, Corsica's second biggest town. It will almost certainly be a stage for the pure sprinters. In any stage like this, the favourite is automatically Mark Cavendish. With 23 stages already to his name, the Manxman is already one of the most successful stage winners in the history of the Tour de France, and after a disappointing 2012, he will be back and hungry for more wins. 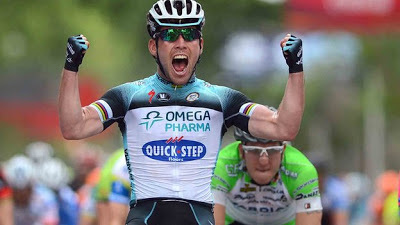 He has a team dedicated to him this year, and after some early issues with the lead-out train, Omega Pharma Quick-Step seemed to have things sorted in the Giro d'Italia and will look to carry that form into the Tour de France. If they can deliver Cavendish to the finish in a good position, he will be very difficult to beat. The only real difficulty is a sharp U-bend around a roundabout within the final 3km. 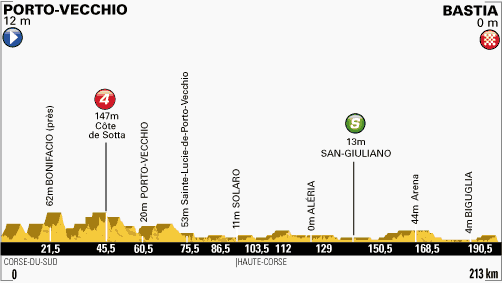 If they can navigate that in a good position, it really is Cavendish's stage to lose. He knows the importance of this stage in getting himself off to a good start in what is expected to be a titanic battle with Peter Sagan for the green jersey. However, there are plenty of other contenders vying to take this first stage, and with it, the prestigious yellow jersey. Heading this list are the German pair of Lotto's Andre Greipel and Argos Shimano's Marcel Kittel. Greipel won three stages last year, although he does not have a team solely based around his success this year, sharing the team's focus with Jurgen van den Broeck. In contrast, Argos Shimano are set up for the sprinters, whether it be Marcel Kittel or John Degenkolb. Kittel is in excellent form this season and has already beaten the likes of Cavendish and Greipel in bunch sprints. 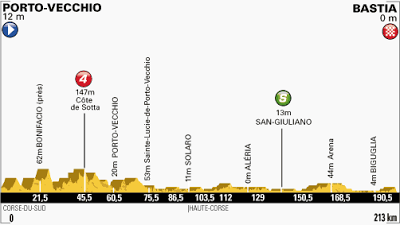 Argos Shimano will focus on Kittel for this stage, and if he can get a good lead-out, he is more than capable of upsetting Mark Cavendish here. Peter Sagan is another rider that might fancy his chances here, although he will be far more of a threat on some of the punchier stages. He struggled a bit in the Tour of California to get himself into the right positions in these flat bunch sprints, and against the quality of sprinter here, I would be very surprised if he were to take the stage win. Instead, he will simply be looking to limit the number of points that he loses to Cavendish. Outside of these names, the likes of Aleksander Kristoff, who is enjoying a good season, Matt Goss, Nacer Bouhanni and Boy van Poppel will all be involved in the sprint. Whether they can win is a different matter, but they all have a chance of at least sneaking a spot on the podium. Mark Cavendish is likely to win this stage, but even given his performance in the Giro, it is tough to back him at odds-on for this stage. He often starts off slowly in the first stage, so I would be hesitant to recommend him here, but it is also tough to go against him. Instead, we shall look at a couple of match bets.